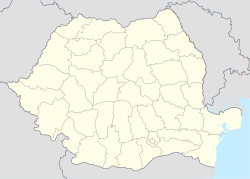 Câlnic (German: Kelling; Hungarian/Turkish: Kelnek) is a commune in Alba County, Romania, composed of two villages, Câlnic and Deal (Dál). Câlnic village is known for its castle, which is on UNESCO's list of World Heritage Sites. Main court of the Câlnic castle. The building to the left is the chapel. Behind the wall, hills surrounding the village and the castle can be seen. Câlnic Citadel, first mentioned in 1269, is very well preserved. Built as a noble's residence, it was bought in 1430 by local peasants and fortified. It consists of a large court surrounded by walls and some buildings adjacent to the walls. In the middle of the court there is a large donjon as well as a chapel. The castle differs from most other constructions of this type in that it is not situated on a hilltop but rather in a depression, much lower than the surrounding hills. This position, clearly inconvenient in case of a siege, can be explained by the castle's first function as a residence, not meant as a defensive construction. Wikivoyage has a travel guide for Câlnic. ^ (in Romanian) "Câlnic", at the Erdélyi Magyar Adatbank's Recensământ 2002; Retrieved on April 15, 2016.